AWeber is without a doubt, one of the best email marketing tool. AW Pro Tools adds extra automation to AWeber and makes your email marketing invincible. AW Pro Tools is not owned or sponsored by AWeber, but officially approved by them. If you are an AWeber user looking to take a big bold step to market efficiently, it's well worth taking a look. You'll understand how you could miss a lot of opportunities by blindly sending out your broadcasts. With so many features and options, AW Pro Tools offer various ways to promote your business to the subscribers you already have. It actually won't take 3 seconds to get your AW Pro Tools started. It will prompt you to connect it to your AWeber account and all you need is to enter your AWeber ID and password. It will be connected right away and you're ready to explore the automation tool. If you want to disconnect it for any reason at a later date, you can do so from "Your Account" menu. There are many automation/integration features in AW Pro Tools and each one has 2-step setup (Trigger - Action). Here's a quick run-through of each feature. Smartlink: Create a link that redirects to your website (WordPress friendly) and segments your subscribers. Optionally it allows you to (1) create an expiring link to redirect to a different URL when the deadline's passed and (2) add 2 x alternative destination URL's - explained a little later. Page Visit: Trigger this automation when your subscriber visits a specific URL. Opt-In: Trigger this automation when a subscriber first opts-in to a list. Message Open: Trigger when a subscriber opens a message. Video View: Trigger when a subscriber reaches a specific second while watching a video. JVZoo Purchase: Trigger when a purchase is made on JVZoo. You can use this as a vendor and as an affiliate. Webinar Link: Register to a webinar (GoToWebinar or WebinarJam or your own webinar link including YouTube) and segment your subscribers with a single link. 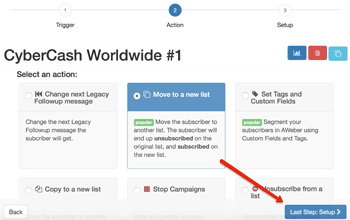 Tag: Move or unsubscribe subscribers with one or more tags applied to them. Manual: Use this to automate any of your manual tasks. Chain Automation: Trigger when another automation runs. Zapier: Trigger this automation from over 500+ services using Zapier. ActiveCampaign Webhook: Update subscribers in AWeber when a webhook is called from ActiveCampaign. Clickbank Purchase: Trigger when a purchase is made in Clickbank. You must have a vendor account in Clickbank to use this. 1ShoppingCart purchase: Trigger when a purchase is made in 1ShoppingCart. There are many more options coming soon in the very near future, triggered by Shopify purhcase, ThriveCart purchase, PayPal payment, Stripe payment, when a new contact is created in ClickFunnels. There are also a couple of optional link direction options, when triggering certain automations. Create an expiring link: the link will redirect to a different URL when the deadline's passed. It can be date-specific, or evergreen (X weeks, X days and X hours). Add 2 x alternative destination URLs: based on certain values in a Custom field in AWeber. Change the next Legacy Followup message the subscriber will receive. Move the subscriber to another list. Segment your subscribers based on certain values in Custom fields and tags. Stop all currently running campaigns for a subscriber. Unsubscribe from an AWeber list. Run different automations based on the subscriber's past engagement. Add the subscriber to a Facebook Custom Audience. Using Zapier, integrate with over 500 services. Or tracking only - don't take any actions. The action can be taken either immediately or delayed at a specific date & time, or relatively (after X days X hours and X minutes). If the subscriber clicks a link the second time, but did not complete a purchase the first time, show them a special offer. Subscribers who reside in USA (based on the IP address when first opted in) will see one video site but subscribers in the rest of the world will see a different video site. If the subscriber has watched until 2 minutes 20 seconds in, copy to another list just before your Christmas campaign starts at 9am, December 10th. Format Email: No need to worry about how your swipe will look like in mobile devices, manually cut a sentence and start a new line. 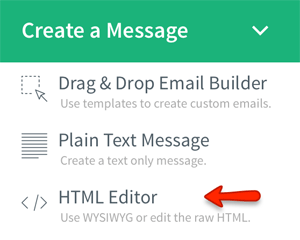 You just type in your swipe in the box, copy & paste it onto your AWeber HTML editor. Clickable video thumbnail generator - just copy & paste a YouTube URL, and it generates a code that you can past it onto your AWeber HTML editor. 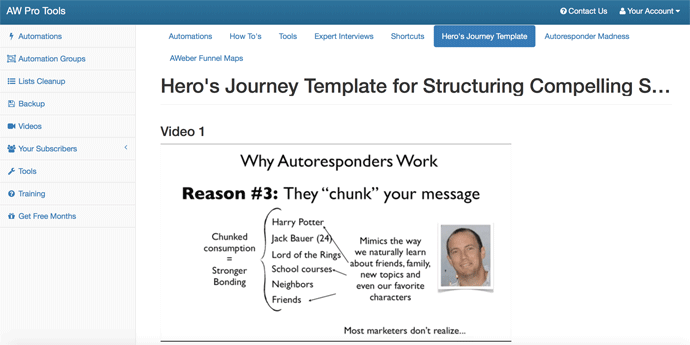 Autoresponder A/B split testing tool. Mobile button - Call To Action button for smartphone with customisable colour and text. 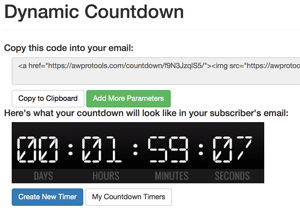 Clickable countdown clocks - set the timer, pre-deadline URL, post-deadline URL and it will generate the code. Paste the code onto your AWeber HTML editor. When your subscriber clicks the countdown image, they'll be directed to either of the two websites accordingly. You can have your email swipe graded and see how your sentences appeal to your audience. All you have to do is to copy & paste your swipe in the box and click "Grade It" button. I have just tested my 10+ lines of swipe and received the following result. This text has 6 sentences, with 81 words (13.5 per sentence) with 1.57 syllables per word. Your email is targeted to readers with at least a 8 grade education (US). That's approximately equivalent of an age of at least 13. In general, you want to target a grade level between 4 and 7. Your email is a bit erudite. (And using words like erudite is not what you want to do in your emails). I recommend that you reduce the number of words per sentence. Shorter sentences are easier to read. Also, use shorter words that everyone understands. In general the fewer syllables the better - but of course this is just a guideline. You can easily overdo it so the key is to make sure your email sounds natural, like you're writing a one to one email to a friend or business peer. Anything between grades 4 and 7 is ideal. 4 : 0 You did not talk about yourself at all. AW Pro Tools can also remotely manage your list of subscribers. "List Cleanup" tool automatically deletes unsubscribed subscribers in order to reduce your monthly bill. In case you don't know - because AWeber counts the number of email addresses that your account holds, whether they're subscribed or unsubscribed. The monthly charge goes up from $19 to $29 when the total number of email addresses exceeds 500 on your billing due date. So un-subscribers in your list should be deleted periodically, whereas AW Pro Tools does it for you. Also it keeps an encrypted copy of the deleted subscribers which you can download as a CSV file. Your lists of subscribers can be automatically backed up on a weekly basis, and the backup copy can also be downloadable as a CSV file. You can move subscribers - single or bulk - from one list to another easily. This is useful particularly when you've created too many lists and want to merge several into one. There are plenty of short videos to explain each feature, and the How-To's are all comprehensive. But there's no knowledge Base in text format, so if you prefer to learn by reading, you might find it a little hard to get a grip of it. Having said that, each feature has a few sentences of description and they're all pretty self-explanatory. And if you have any problems, you can always contact the helpdesk using the webform from the menu. There are some features that only available with "Professional" option or above, so do check if "Startup" option is good enough for you. Personally I wish the pricing plan per number of subscribers was in line with AWeber's. Also I find "Smartlink" feature on its own is worth using, so I wish the Startup option price was a little lower and was more accessible by email marketers with smaller capacity. But that's just my opinion. There are too many things that you can do - can be overwhelming at first?